Make this super-easy, one-bowl showstopper for friends. If you don't get some oohs and aahs, it's time to get new friends. Prepare cake batter, in 2-1/2-qt. ovenproof bowl, as directed on package; scrape side of bowl. Bake 1 hour 5 min. or until toothpick inserted in center comes out clean. Cool cake 10 min. Loosen cake from side of bowl with knife. Invert onto wire rack; remove bowl. Cool cake completely. Meanwhile, microwave 4 oz. chocolate in large microwaveable bowl as directed on package. Cool. Add 1 tub COOL WHIP to melted chocolate; whisk until blended. 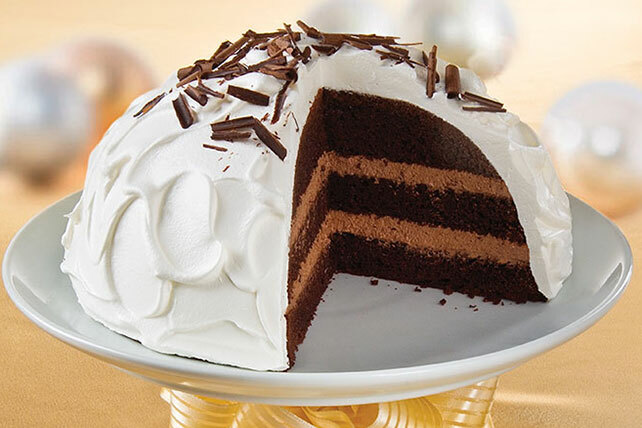 Cut cake into 3 layers; stack on plate, spreading chocolate filling between layers. Frost cake with remaining COOL WHIP. Make curls from remaining chocolate. (See Tip.) Place on cake; sprinkle with sugar. Keep refrigerated. For easy cleanup, the cake is made and baked in the same bowl. Warm chocolate slightly by heating it in the microwave for a few seconds until you can just smudge the chocolate with your thumb. Hold the chocolate steadily between your thumb and fingers of one hand and draw a vegetable peeler slowly over flat bottom of chocolate piece. Allow a thin layer of chocolate to curl as it is peeled off the bottom. This will make long delicate curls. To make short curls, use the same technique on the narrow sides of the chocolate piece. To arrange curls on a dessert, use a toothpick to lift them into place.